Coming from the Royal College of Art, London tutored by John Bratby, Reeves was influenced by and a great admirer of the work of Eric Ravilious, Paul Nash and Edward Bawden. He made an immediate important impact in Glasgow School of Art, by setting up the specialised Printmaking Department, separating it from commercial graphic art, bringing it into the Fine Art Department of Painting & Drawing. He invited many of the leading British artists and printmakers of the day to Scotland as external assessors, including Harvey Daniels, Michael Rothenstein and Kenneth Rowantree. 'Living in various areas of the UK, whether they be rural, town or city, has always attracted my visual curiosity. It might be the Wiltshire Downs; the Regency architecture in Gloucestershire; or the structure of the canals in the city of Glasgow. So with a sketchbook in my pocket or bicycle basket, I made many drawings and notes which ultimately turned into a suite of etchings. I am referring to the prints created in the years 1949-1959. 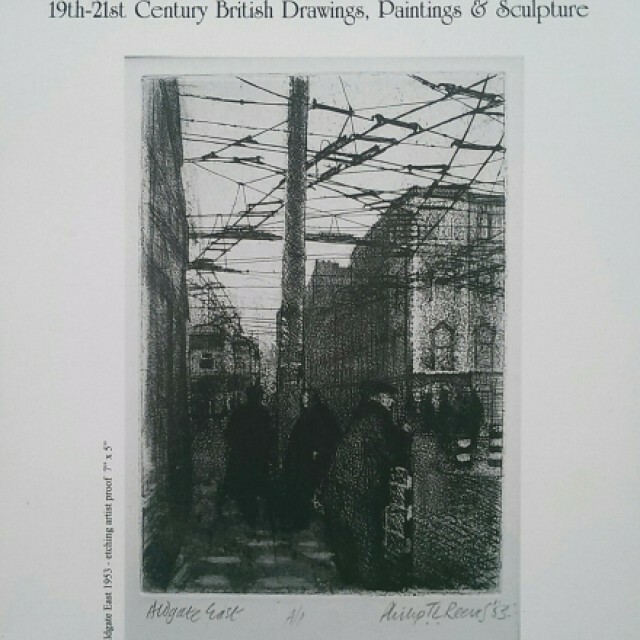 Fortunately, in 1967, with help from the Scottish Arts Council, Reeves was instrumental in starting and setting up the Scottish Printmaking workshops and studios that exist today. Since the 1950s and 1960s he has built up an important reputation with numerous exhibitions, including two major retrospectives in the Talbot Rice, Edinburgh; the Hunterian Museum & Art Gallery, Glasgow. His solo shows include the Fine Art Society; New Charing Cross Gallery, Cyril Gerber Fine Art and Compass Gallery, Glasgow; Glasgow & Edinburgh Print Studios; the Crawford Art Centre, St Andrews; the Lillie Gallery, Glasgow and Kelvingrove Art Gallery, Glasgow. Between 1949-1959, he created the drawings, paintings, etchings and lithographs in this exhibition, over 45 rare artists proofs of exceptional quality, until now tucked away, forgotten for many years.